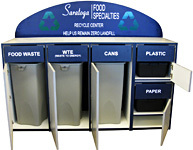 Laminated plastic cabinet bodies, flip doors and a variety of top surfaces and options make our restaurant style waste receptacles and bussing stations the perfect trash container choice for any interior commercial or institutional application. Tough, laminated surfaces are intelligently designed for good looks that last. High pressure plastic laminate self return, swing pushdoors with white, permanently routed letters are standard. 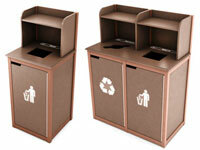 Rigid plastic liners are included with each unit. Open to the floor design with welded steel base on selected models insures extended trash receptacle product life even with the heaviest use.